The Primate Cognition Laboratory is part of the Department of Psychology at Columbia University. Our research focuses on the cognitive abilities of non-human primates: their ability to learn lists of pictures and numerical stimuli and to evaluate their own performance on various tasks. Most remarkable is that they can engage in these cognitive activities without the help of language. 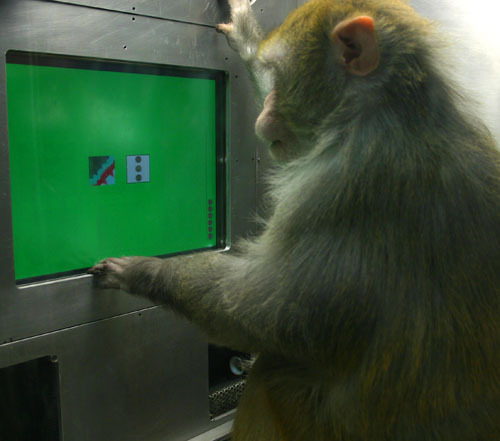 We devise experiments where monkeys touch pictures on a touch sensitive computer screen with the opportunity to earn pellets. By analyzing how they perform on these tasks, we can begin to understand the evolution of human cognition and its pre-linguistic origins. This monkey is placing wagers on his performance. Click here to find out more.